We finally have a Garage YEAH!!!! Garage Yes! Driveway NO! Boo!! Hopefully we will be seeing a driveway soon and that load of dirt and wood removed from my sight forever!!!! We still have some finishing to the garage but hey the structure is finally pass inspection and up!!!! I feel excited we might actually move in to this house in the next few weeks. Boring for you to see these mudded walls but so exciting for us. We have walls and ceilings in the basement. They will finish these this week with some sanding and primer. The basement is coming together nicely to give us extra living space in this tiny cottage home. There will be a family room fireman cave, a office area for Terry, a storage/bedroom, a full bathroom and a huge laundry room with storage. Ahhhhh I am so excited. Terry and I will do all the finishing touches like painting of the walls and installing floors ourselves. We will also finish the bathroom ourselves. Doing some of the finishing work ourselves will save us money on an already over budget renovation. I ordered this console table after seeing it on Kim Savvy Southern Styles Blog. Just love the chippy goodness to this piece. Kim ordered hers from Houzz. I found it for less on Overstock.com and had a coupon and free shipping. The first piece arrived in pieces so Overstock.com sent me a brand new one. The replacement arrived without any damage. Yeah! I was going to put this console table in the living room entry but it is too big for the space so no worries Terry has tools!!! This beautiful piece is going to be made into a dining table. Since I have another top from the first delivery where the legs were busted he will have enough to make a nice square table top. He will bring the chippy legs closer together and make this long console table into a nice and sweet little kitchen table. That is the plan anyway. So stay tuned I cannot wait to show you how this will be reloved into a new kitchen table. Here is a preview of the new kitchen chairs. I took these gray slipcovers and sent them to Lisa Harmon that has worked on other slipcovers for me. 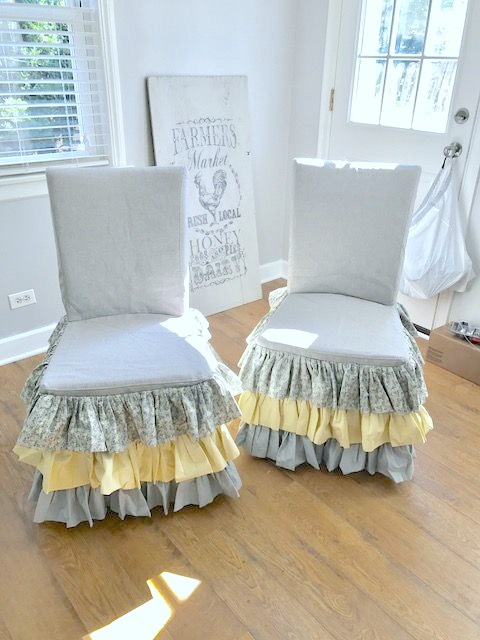 I also sent three matching fabrics to make these ruffles on the chairs. Lisa does the best work. Here is her website and I will have more on her when I do a final post of the kitchen when done. As you can see I am adding some sunshine yellow to my cottage kitchen. Now for some Cuteness Over Load!!!! As most of you know we are adopting this sweet little Miss in a few weeks. So far it looks like a lot of you voted on her name to be Lucy. I think we will get her and then see what name will fit her personality. A few new names I am favoring is Belle and Daisy. We cannot wait to bring her home. The breeder keeps in touch with me and he sent me some pictures of one of "Lucy's" daughter's pups. One of her pups named Lemon Drop had her pups that are ready to go to new homes. These sweet little fur bundles just make me smile. This is Lemon Drop and her cute pups that are all red except for one red and white. Lemon Drop and her pups are on the other side of the fence. The little pups are from another basset hound named Belle. They still have a few weeks before they will be going to their forever homes. As you can see the one and only red and white is singing and showing off. I guess when you are different in looks than your brothers and sisters you have to sing to stand out. Lemon Drops pups are going to their forever homes now. They are just sooo cute. This is Boris the father of these beautiful puppies. As you can see he is a big lug of love. I cannot wait to get little Miss Lucy, Emma, Belle, Daisy soon! She will be a wonderful addition to our family. Have a great new week. I cannot wait to get moved in our home in the next few weeks and start to unpack my chippy decor items for the new cottage. Oh how great to have the garage up and the basement is looking amazing too. Not long now and you can move in. How fabulous. So much progress! I remember the shell of the basement structure, so this looks fabulous to me too, Kris! And the garage, furnishings (yay, that definitely means close to finish line!). And Lucy (yes to Lucy with that red)! Lol, Boris reminds me of my Gaylord mechanical dog I had as a kid. Remember that toy? Lug of love, hehe. Everything is looking good in your new home Kris and I'm happy for you that your garage is finished. I'm envious of your wonderful basement space and can't wait to see the finished look. Also, the table is perfect and how nice that your Terry can repurpose it the way you want! Mr. Sissie can't hammer a nail, LOL! Love your new fur baby too. LOVE THE IDEA OF HAVING A DOOR RIGHT INTO THE BASEMENT! Ours is finished as well and adds the extra space to the house. Oh I'm in love with that table. It will look stunning in your new kitchen with those sweet chairs. So happy you are getting another dog to love, I can't imagine not having one in my life. I look forward to Terry's table build! Oh, no, the first table was in pieces. I'm glad they let you keep it and I can't wait to see the new dining table. What a great idea!! Wow everything is suddenly coming along quickly.That table is going to be gorgeous as a dining room table! Good to hear the three of you are going to begin your new journey in Cottage III soon. Can't wait to see all the room reveals! Oh my yes, what cuteness are these doggies! I'm SO glad she's coming to live with you. I can't wait to see your home when you're all moved in. That garage is cottage-y cute too. Fantastic update on your home! I know you must be thrilled, and I absolutely adore the slipcovers, especially the yellow ruffles. So cute! Have a blessed and peaceful Sunday! Love the pup update! So cute and I know you're excited about getting your bundle of love home. Hope you get a driveway soon too. Your house is coming right along! Love the table and the ruffled chairs. You always such a clear vision for the look you want...I envy that!! The dogs are adorable! Can't wait for Miss Lucy to make herself at home in your cottage. Life sounds good, Kris! The house is coming along beautifully and soon your new pup will be home! I love the photo of the singing dog...brought back such memories of our three bassets! That's a lot of progress! The garage looks great! I hope they'll get there quickly and put the driveway in. You guys are doing all of this the right way so it always takes longer. The pups are an overload of cuteness- I mean who can resist those long floppy ears! I like the new table and the chairs are very cute. The basement level looks really good- drywall is such a messy job but you'll be so thrilled when it's all done. We drywalled part of our basement and I love having the finished ceiling- makes for a nice look! Hi Kris, I think that animals have got to be the greatest angels in the world. these pictures just made me smile. I love that you are adding the yellow to your cottage. It is so sunny shiny just like you. It won't be long now you will be in before you know it. Have a great week. The garage looks great and that basement is going to be terrific after you work your magic on it. So much space for you. The table is so pretty and I am sure when Terry finishes it, it will be exactly what you want. Oh those little puppy's are darling and I can hardly wait to see your new baby in her home. You will know what to call her when you get her home and see how she acts, and her personality. Yeah on the garage progress! And the basement is looking great too. Love your new slip covers. And your new sweet pup will just add the finishing touch to your new home! Oh my goodness, I'm beginning to fall in love with bassets all over again! And I can just hear the little red and white one howl. I can't wait for yours to walk into her forever home and discover that she has landed in paradise. All your house news is so exciting, Kris, even the mudded walls. I can't believe how much room your new basement will have, almost doubling your space? The new kitchen chairs are darling and that table base is too! I'm sure it will be even better when Terry gets through with it. I do love being in on this from the very first! Y'all are the most creative couple I know! I am soooo happy to see the progress being made on your house and garage. Your basement is going to give you so much wonderful added space to your home. Oh you have a garage!! !....and a great looking basement in progress!...Things are coming along...and that Miss "Lucy Belle" or Daisy Belle" or whatever cute name you will name your new love ... is adorable! And, you and Terry certainly know how to make lemonade out of lemons...great idea on that table! Your garage and basement are looking good! I can't wait to see the finished product. Your sweet dog is adorable. I voted for Lucy, but she also looks like a Daisy! I am trying to adopt a rescue Yorkie right now, so I understand your excitement. Good luck! Ahhhhhh so excited for you. Enjoy getting that special little Yorkie to love in your lives. So sweet. Good luck with the adoption. I'm crushing over your chairs, Kris. They're darling! And your idea for the table is brilliant. Can't wait to see it all come together. The garage looks great. It won't be long before you'll be using it. The basement is really coming along. It's all going to be so wonderful for you and Terry. And your new addition -- Lucy or Daisy. Both cute names, though I kinda like Daisy because it's such an old-fashioned name that seems to belong with a cottage. Either way, she's sweet. And lucky to have you as her humans. :) Hugs. I'm so glad everything is falling into place for you Kris. The basement area is going to be fabulous!! Yay! A garage! A basement almost ready to finish! Hurray! So happy for you to be at this stage finally! And oh my goodness, those puppies! Aren't they just too cute?!? Can't wait to see what name your new pup ends up with. All great names! I love puppies of all breeds, but Lemon drops are just precious, especially the one howling out his existence. LOL. I think the table made into a square table will be fabulous. It seems as if it was meant to be that the first one came damaged. Making lemonade again from lemons. Getting so excited for you to be able to be in you new home soon. Have a great week. The garage looks great and everything else is coming along. I'm amazed that such a robust table didn't make it in one piece. Good for you though. Now Terry has some material to create the perfect dining table. I just love the long ears of basset hounds. So cute! Have a great week with some more finished house projects, Kris! When all is done I am sure you will be so happy in the new home with your new bundle of love! YAHOOOOOOOOOOOOO! Good news from your end! This is FANTASTIC stuff happening over there, and that table, that is PERFECT! I love the combination of white and wood. And the puppies, oh my, what a grand surprise, Kris! Wishing you more and more fun surprises. YOU deserve them! I love that you are bringing in yellow . Our last little Cottage had a lot of yellow and it made the Winter days feel so happy. You are making your new nest at the perfect time of year. Fall cozy down pumpkin Latte time of year. You are going to have so much fun getting settled. Take it slow and enjoy each day. I can't believe how much progress has taken place in just a week! Yay! The table is beautiful, and wow, Terry seems to be able to do everything! It's going to be one awesome table. You weren't kidding about cuteness overload :). Looks like your walls are a light gray...? Boris just made me smile. Well, the entire post made me smile. I am so happy things are getting done! Looks beautiful to me! Congrats on the garage. You are in your element fixing things up. The excitement is contagious. Love the chairs! Love the table. I am sure you will be so happy in the new home with your new bundle of love! Good news! The garage is finally there and the basement has progressed a lot... It actually looks like my upstairs right now! Yay. I'm so happy for you. You will love your new addition. I love the table. It will be gorgeous. It's good to see that things are moving along with the renovation. Oh, my goodness. Those puppies are so adorable. Progress! yay! Can't wait to see it all finished. Love the pretty sofa table you bought and how you plan on using it. The puppies are precious! I'm glad that you will be able to fill your new home with more puppy feet too. I love the way it looks! Can't wait to see more of your work. By the way, I just found this home improvement offer: http://thehomeexpert.uk/offer/kitchens/. Do you think it's worth giving a chance?